Group.getByName searches the Group for the first instance of a child with the name property matching the given argument. Should more than one child have the same name only the first instance is returned. World.separate has been optimized to cut down on the number of calls to intersect from 3 calls per Game Object collision check, to 2. So if you were colliding 50 sprites it will reduce the call count from 150 to 100 per frame. It also reduces the calls made to seperateX and seperateY by the same factor. Two immovable bodies would never set their overlap data, even if an overlap only check was being made. As this is useful data to have this has been changed. Two immovable bodies will still never separate from each other, but they willhave their overlapX and overlapY properties calculated now. The full change logs are available here. Welcome to another episode in the “Closer Look at” game engine series. The closer look series is a combination of getting started tutorial and review to help you determine if a game engine is the right fit for you. Today we are looking at the QICI Engine and HTML5 game engine built over top of the Phaser framework which itself uses the Pixi graphics renderer. Normally when I work with a game engine, I have to spend several weeks with it before I can put together one of these guides. With QICI, it took substantially less time, only a couple days, to come to terms with the engine. This isn’t a slight on QICI in the slightest. First, I am a big fan of the Phaser engine it is built on, so this gave me an immediate familiarity. Second, it is just an extremely good, well designed, capable and well documented game engine. Hmmm, bit of a spoiler there I suppose, but I really like the QICI engine. Read on to find out why. As always, there is an HD video version of this guide available here. The engine is available for download here. It is bundled as a zip archive while available on Github (the code is not directly on Github however, but is included within the archive). Simply extract the archive contents then run start-win.bat or start-mac.command depending on platform. The engine is built around NodeJS and Node must be installed before using the QICI engine. The code is released under the MIT license, making QICI both free as in beer and free as in freedom. There are future hooks for paid plugins, but currently all plugins are available for free as well. Here you load existing or create new projects. Creating a project is simply a matter of selecting an empty directory and clicking Create. The editor supports common features like drag and drop, tool tips, resizes well in the browser and frankly doesn’t feel like a web app most of the time. I encountered the occasional glitch where the cursor got stuck in the wrong mode, but they were uncommon and easily avoided. Frankly, if you weren’t in a web browser, you would have no idea this was a web application. Oddly, no Android love. Not really a big deal, as this just sets the dimensions and a Free Aspect option exists. Your game project is composed of one or more scenes. We can add, reload and save scenes via the project menu. Select Plugins->Arcade->RigidBody. You will see in Inspector, we now have an additional component to configure. As you can see, you can preview the running of the scene directly in the editor. Assets can be imported into the engine using drag and drop, or by simply copying them into the folder in the underlying file system and click reimport in the UI. What might not be immediately obvious is how you actually code in QICI and of all the features, this one is probably the least intuitive. You code by attaching behaviors to your game entities. Therefore, if you are familiar with Phaser, you should be immediately comfortable with QICI. For more help with Phaser, I have already created a fairly comprehensive tutorial series. This is a very new project, just shipping the end of last year. There isn’t much of a community per say, but there is a fledgling question forum. Hopefully in time a proper community forms. In terms of documentation however, QICI Engine is good, shockingly good in fact. There is a complete guide available here walking you through the fundamentals and primary components of QICI. With the exception of a good scripting guide and a document on program flow, I found everything I was looking for in sufficient detail to accomplish what I needed. There is also a very good searchable reference guide available here. Between the two, and with prior Phaser experience (which is also remarkably well documented), I had no trouble whatsoever getting up to speed. Additionally there is a pretty good collection of examples available here on Github. Frankly, for a young open source project, this is hands down the best documentation I have ever seen. Kudo QICI team. This is a game engine that takes one of my favourite HTML5 game engines (Phaser) and adds an incredibly polished layer of tooling on top of it. Additionally a straight forward component system is added, while not getting in the way of the underling libraries. If you are looking for a 2D HTML5 library, especially if you are already familiar or working with Phaser, this is a project you absolutely have to check out. It is robust, straight forward, well documented and well designed. Aside from the lack of community, there really isn’t much more you could ask of this great new engine! I enjoyed my time with QICI and will be exploring it more in the future. Let me know if this engine interests you and if you would like to see some tutorials from GameFromScratch. Special thanks to @Dillybob on Twitter for bringing this engine to my attention. QICI Engine is a HTML5 game engine and toolset layered over top of Pixi and Phaser, a library I am a huge fan of. The engine is well documented and completely free. The source is available although oddly enough the Github page just contains prepackaged archives. 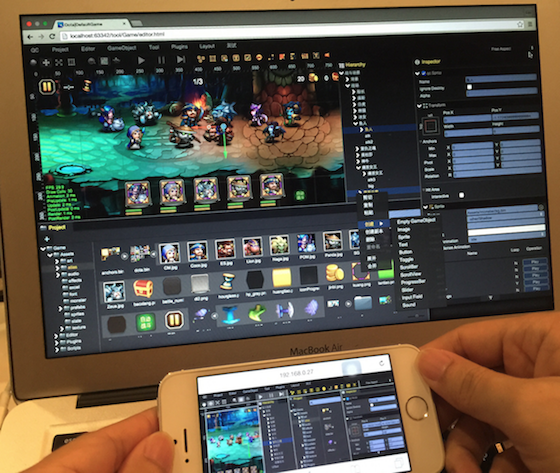 QICI Engine is based on the free and open source HTML5 game framework Phaser, which uses Pixi.js for WebGL and Canvas rendering across desktop and mobile web browsers. 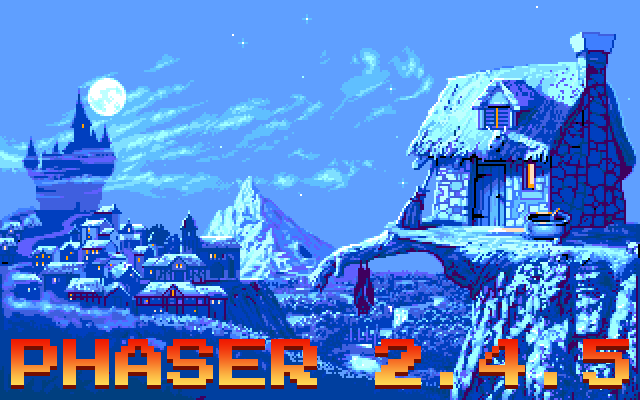 Phaser is actively developed and maintained by @photonstorm, but QICI Engine uses the specific version Phaser 2.3.0. We keep track of bug fixes and performance improvements for Phaser, so you can use the customized Phaser version that QICI Engine provides safely. 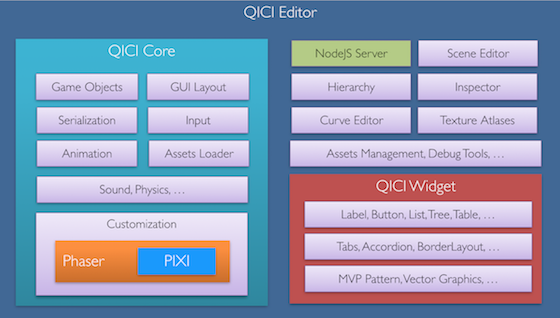 QICI Editor: A web-based editor with a Node.js server for accelerating HTML5 game development. The QICI Core is the core of QICI Engine, the QICI Editor would not work without it, but the QICI Core can function on its own to be used to make a HTML5 Game by writing code without QICI Editor. But for complex UI, it’s really hard to build and maintain without the help of WYSIWYG visual interface, with QICI Editor even artists and designers can help to build the game’s UI. QICI Widget provides the HTML5 UI widgets for making the GUI in QICI Editor. UI Components: Toggle, Slider, ProgressBar, ScrollView, List, Table, etc. Very cool project and certainly one I am checking out. Oddly however, when you download the current version from their website, on first run they tell you an update is available and you download it. I hate when this happens. Phaser, the popular open source HTML5 game engine, are having a 50% off Black Friday sale (*cough* It’s Wednesday btw… *cough*) with all of their items half price. I'm a huge fan of Phaser, in fact did a complete tutorial series on using it, so love to see them get the support they deserve. Click here to head on over to the sales page. Also stay tuned for the real Black Friday, where I will attempt to gather all the game dev related deals together in one place.